Alleging manipulation by the Bharatiya Janata Party-led Madhya Pradesh government in the revision of electoral rolls in the state, the Congress petitioned the Election Commission (EC) on Sunday and said that nearly 12% or six million of the state’s approximately 50 million voters are fake “and fraudulent”. A Congress delegation led by its Madhya Pradesh unit president Kamal Nath and campaign committee chief Jyotiraditya Scindia met EC officials on Sunday morning and submitted a petition giving details of the allegedly “bogus and fraudulent” voters based on its surveys in 101 constituencies, Nath said after the meeting. The petition was accompanied by a presentation listing out examples of fake voters. He said the number of voters in the state has gone up by 40% in the last five years while the state’s population had increased by 24% . The Congress pointed to a large number of instances of individuals with multiple voter registrations in the rolls published by the EC on January 1. 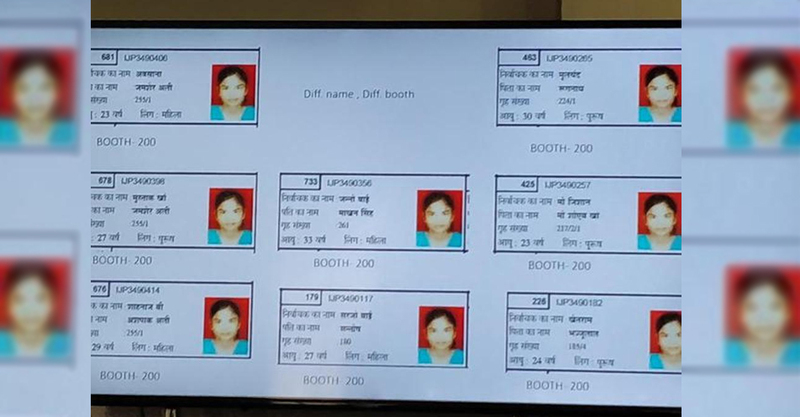 In one case, Scindia pointed out that a woman resident of Betul was registered under 26 different names with the same picture at the same polling booth. “It is shocking. The present Madhya Pradesh government is behind this,” he said. An EC official said on condition of anonymity that two teams are being deputed to probe the allegations of errors in electoral rolls. The teams have been asked to submit reports by June 7. While one team will carry out the probe in Bhopal, another will do so in Narmadapuram. Scindia said that the Congress’s state unit had studied 101 constituencies and found nearly 2.5 million voters with multiple votes in the same polling booth. “Nearly 12% voters are fake and the gap between the Congress and the BJP (vote shares, in the last election) was 9% ,” he said. The Congress has demanded that state officials found responsible for registering fake voters should be prosecuted under the law and a fresh electoral roll should be prepared. The entire team of MP’s top Congress leaders — including Nath, Scindia, former chief minister Digvijaya Singh, state in-charge Dipak Babaria, Rajya Sabha MP Vivek Tankha, and Suresh Pachouri — were part of a delegation that went to EC to submit their findings. “There should be action against officials under Section 32 (of The Representation of the People Act),” Scindia, the Guna MP demanded. The act stipulates up to two years in prison for officials found in breach of official duty in electoral roll preparation. The EC had earlier said that the state’s electoral rolls would be ready by July. The Congress has sought an extension of the deadline to fix the problem and also that officials found guilty of registering bogus voters be kept away from electoral duties in the future. The EC takes the help of state governments and appoints its officials as Electoral Registration Officers for preparation and revision of electoral rolls.